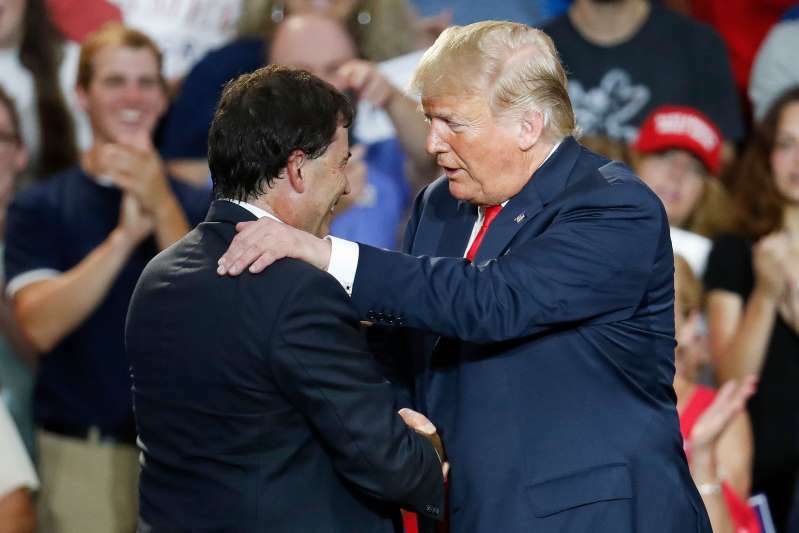 President Donald Trump, right, shakes hands with 12th Congressional District Republican candidate Troy Balderson, left, during a rally, Saturday, Aug. 4, 2018, in Lewis Center, Ohio. The so-called Rust Belt made Donald Trump president of the United States and now it could help take away his immunity by House majority. Republican Troy Balderson may have snuck by Democrat Danny O’Connor with a fully operational GOP turnout machine behind him to win the special election in Ohio’s 12th congressional district. But the two candidates were separated by around 1 percentage point with almost 4,000 provisional ballots left to count in a district Republican Rep. Pat Tiberi won by nearly 37 points less than two years ago. That should be no comfort to the GOP. You can’t expect a newbie to perform like an incumbent, but both Mitt Romney and Donald Trump carried the district by 11 percentage points. There are 68 GOP-held U.S. House districts with a more Democratic lean than Ohio’s 12th. Democrats only need to pick up 23 of them to grab the majority and subpoena power over the Trump administration. [post_ads]The GOP still has what could be insurmountable advantages heading into November. But what’s going on in the Rust Belt in general should have Republicans praying for intervention from their higher power, Vladimir Putin. Trump's numbers in the key Midwest states he pulled from Democrats are plummeting and as he claws for his political life, he seems to be pulling down his party with him. Republicans are trailing in polls for the governorships they’ve held since 2011 in Wisconsin, MichiganandOhio. A recent NBC/Marist poll found that 63 percent of Wisconsin voters and 62 percent in Michigan say that Trump doesn’t deserve another term. His approval rating is below his national average at 36 percent in both states. In two June polls of Ohio, voters disapproved of Trump by double-digit margins. Much has been made of Trump’s continued popularity with white voters, particular white voters without a college education. And while Trump is still 3 percentage points above water in Michigan with a group he once called “the poorly educated,” he’s 6 points below with the same group in Wisconsin. But people who look at only race will miss the larger story of what’s going on with Trump’s crumbling numbers in the Midwest. Income tells a much clearer story. In Wisconsin, Trump is at 41 percent approval among voters earning over $50,000 and only 28 percent with those earning less than that.In Michigan, 32 percent of those earning under $50,000 approve of Trump compared to 37 percent earning over $50,000. Political scientist Josh Pacewicz argued that Trump’s popularity in the Rust Belt was the result of “undirected populist resentment at a technocratic, corporate-friendly elite.” The “corporate-friendly elite” might as well be the name of the Trump administration’s softball team, if they’d ever heard of softball. Trump’s policies have been precisely tailored to pleasure the richest. Under his tax law, businesses received nine times more in cuts than what they gave their workers and spent 37 times more on stock buybacks than on bonuses since the reforms became law, according to an April analysis by Americans for Tax Fairness. Now Trump’s Treasury Secretary has suggested that the administration may serve up another $100 billion in tax cuts that will go just to the richest of the richest, who just happen include much of Trump’s cabinet, family and big donors. Predatory lenders and corporate criminals are getting lush new protections while the Great Lakes are under attack. And if there is an economic boom going on, it’s flowing mostly to the sort of Americans who can pay a $200,000 initiation fee at Mar-a-lago and/or Democrats. An Associated Press report finds that 58.5 percent of the job gains from May of 2017 until May of this year were in counties that backed 2016 popular vote-winner Hillary Clinton. These are mostly the areas of the country that were doing pretty well under Barack Obama. If you were a voter who was only willing to tolerate Trump’s race baiting in order to get some actual relief for your community or to punish “the elites,” putting kids in cages, cracking down on legal immigrants and deporting veterans’ wives is a poor substitute. Trump’s problem is that voters in the Rust Belt know actual populism looks like. A Quinnipiac University Poll found Sen. Sherrod Brown, D-Ohio, has a healthy 55 percent approval rating and is leading his Republican opponent by 17 percentage points. Brown has supported Trump’s efforts to reshape trade (some of which look a lot like what the Obama administration negotiated). But he opposes pretty much everything else Trump has done — from tax cuts for the rich to continued attempts to repeal Obamacare and make massive cuts to Medicaid, a quest that will definitely resume in 2019 should the GOP keep the House. In exchange for their votes for gold-plated populism, Midwesterners got a plutocrat in need of platinum pacifier. If Trump is going to fool them again, he'll need a new act — or an old one with a super-strong dose of what he knows best: scaring white people.